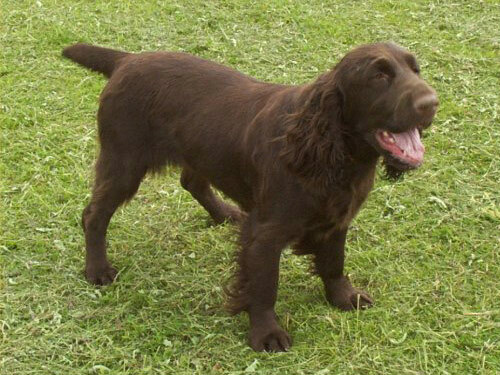 If you are seeking a rather fun and chipper dog, the Field Spaniel is the one for you! While they adore being independent creatures, they are equally as joyous to fulfill any duties for their owners. Loyal canines, they are affectionate and sweet as well as very animals around other dogs. If you can provide it with the time each day to expend their energy levels they can be a very well behaved family pet. They tend to be quite and to themselves around strangers entering their homes, but overall are quite timid and kind hearted animals. This is one dog that requires movement, they are not a smart match for an owner that is not as active as they are. The Field Spaniel is very energetic, playful and full of life. Natural explorers, they will crave to get around outdoors and love roaming in a large and open space of land. They are at their best when they have the opportunity to reside in and outdoors all year long. A family with a large yard or lot that is safe for their Field Spaniel to roam about in will be best. While they make exceptional watchdogs, this type of Spaniel is not well known for being any form of great protection should they engage in any combative situations. Requirements to successfully upkeep your Field Spaniel are to permit them a playful environment that bodes a fair amount of human stimulation and contact as well. As far as major health concerns are noted by experts, the Field Spaniel does rather well in this department. They only have CHD, and that is not a guarantee in all dogs of this breed, just a noted common ailment that can possibly effect them over time. In some other situations, the breed has been noted to develop an overactive thyroid disease and otitis externa as well. In very rare circumstances, they have also developed heart murmurs, patellar luxation and even seizures. Your vet may recommend regular preventative health screening for the dog involving their eyesight, hips, elbows, patella, thyroid and their heart also. Average lifespan for a health Field Spaniel is from twelve to fourteen years long. They generally weigh around thirty-five to fifty pounds as full grown dogs. They originated in the 18th century, in England getting little attention next to their family hounds the English Cocker Spaniel as the Field Spaniel was smaller in size. Eventually they received their own notoriety in the 1800's as getting their own separate recognition as a different form of land spaniel. They had a brief stint of popularity as exceptional hunters, they actually almost became extinct at one point in the 1900's. In the middle of the 19th century, they did have a second boost of expansion and many people to this day commonly confuse the Field Spaniel with a Cocker Spaniel. While they are very loving creatures, they are not a very popular or common breed currently in the United States.